Sister Aimee Gillen, CSJ, 82, died Friday, December 29, 2017, in the 64th year of her religious life as a Sister of St. Joseph. The daughter of Raymond and Marie McNellis Gillen, Sister Aimee entered the Congregation from Our Lady of Lourdes in Altoona, PA. 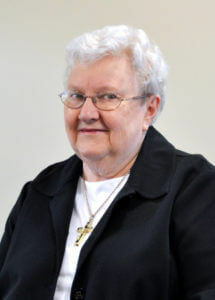 Throughout a 47-year ministry in education, Sister Aimee was devoted “to teaching as Jesus did.” She taught at 13 schools in the Dioceses of Pittsburgh and Altoona-Johnstown, including Mount Gallitzin Academy in Baden (2000-2005), Good Samaritan School in Ambridge (1989-2000), and Sacred Heart School in Altoona (1971-78), where she also served as principal. Considering it a privilege to be part of the nurturing process of her students, Sister Aimee envisioned the children as future builders of the Church and society. Describing her classroom as a model of calmness and creativity where academic standards were set high, colleagues remarked that Sister Aimee recognized and encouraged the individual gifts and talents of each of her students. She often said that teaching young children was the most rewarding experience of her religious life. Sister Aimee is survived by a sister, Cecelia Ann Haines of Altoona, PA, nieces, nephews, grandnieces, and grandnephews, the Associates, and the Sisters of St. Joseph of Baden. Friends will be received Monday, January 1 from 1 – 6 p.m. and Tuesday, January 2 from 11 a.m. – 2:30 p.m. at the Motherhouse of the Sisters of St. Joseph. Prayer Vigil will be Monday, January 1 at 6 p.m. at the Motherhouse. Mass of Christian Burial will be offered Tuesday, January 2 at 3:00 p.m. Burial will follow in the Sisters’ Cemetery on the Motherhouse grounds. Donations in the name of Sister Aimee may be sent to the Sisters of St. Joseph Memorial Fund, St. Joseph Convent, Development Office, 1020 State St., Baden, PA 15005. Make a gift in memory of Sister Aimee.